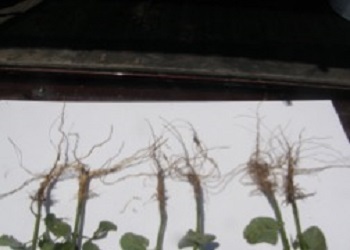 In this trial, the soybeans treated with Ethos 3D insecticide/fungicide on the far right, had the greatest root mass, followed by the soybeans treated with Capture 3RIVE 3D insecticide on the far left. The soybean roots in the center were from the untreated check. 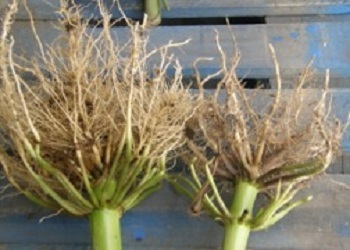 Treated plants exhibited a more robust root system, having been protected against seedling insects and root diseases. The roots and root hairs do the important work of transporting water and nutrients to the plant to maximize yield. FMC Corporation introduces Ethos 3Dinsecticide/fungicide, formulated specifically for the novel 3RIVE 3D in-furrow application system that converts traditional high-volume applications to low-volume applications through patented technologies. Ethos 3D insecticide/fungicide provides full spectrum seedling insect and disease protection for corn, soybeans, dry beans and peas. It combines bifenthrin insecticide with a biofungicide that grows along with the root system to protect against damping off diseases including Pythium, Phytophthora, Fusarium and Rhizoctonia. It also provides control of wireworms, grubs, seed corn maggots and corn rootworms. "The biofungicide colonizes root hairs and grows with the root structure building a defensive barrier to infection from fungal pathogens. You can see a visual difference in the root health and mass when you compare plants that were treated with Ethos 3D insecticide/fungicide and plants that were not," says Christina Coen, FMC Marketing Director, U.S. and Canada. "Seedlings emerge more uniformly and with the vigor to optimize productivity when Ethos 3D insecticide/fungicide is applied at planting." Thirteen university research trials conducted in Nebraska, South Dakota, Wisconsin, Iowa and Colorado in 2017 demonstrated that corn treated with Ethos 3D insecticide/fungicide had an average 11 bushel per acre yield advantage compared to the untreated check. Coen adds, "We are very excited to offer a second product for the 3RIVE 3D application system, which is being deployed on more acres every year. Growers have been asking for additional products and FMC has several products in the pipeline that we anticipate to launch in the next year or two." The Ethos 3D insecticide/fungicide application, left, exhibited much better root growth protection than the untreated check on the right. The improved hair root development allows for greater moisture and nutrient uptake. Treated plants were also larger and more robust with improved vigor. The 3RIVE 3Dapplicationsystem offers growers precision, speed and convenience with the ability to cover up to 480 acres between refills. It delivers a continuous Zone of Protection into the furrow for seedling defense and yield enhancement. Ethos3D insecticide/fungicide and the 3RIVE 3D application system, are part of FMC Freedom Pass, which includes application innovations, agronomic rewards, product financing and product assurances. For more information on Ethos 3D insecticide/fungicide, visit the product page, here.